Sources within the Elections Department have revealed that a large number of recognized political parties and independent groups had been unable to obtain seats in Parliament at the recent General Election. The department’s reports show that only five recognised parties out of 35 were able to obtain parliamentary seats at the polls. Meanwhile, all 201 independent groups which contested failed to obtain sufficient votes from each district. The Democratic Party (DP), led by Field Marshal Sarath Fonseka, obtained 28,587 votes, which was insufficient to win them a seat in Parliament. The Frontline Socialist Party (FSP) went the same way, earning 7,369 votes. The sources also revealed that the Tamil United Liberation Front (TULF) led by V. Anandasangari had accumulated 723 votes in the election. The Bodu Jana Peramuna, established under the leadership of Bodu Bala Sena (BBS) General Secretary Galagodaatte Gnanasara Thera, got 9,522 votes from 15 districts. M.K. 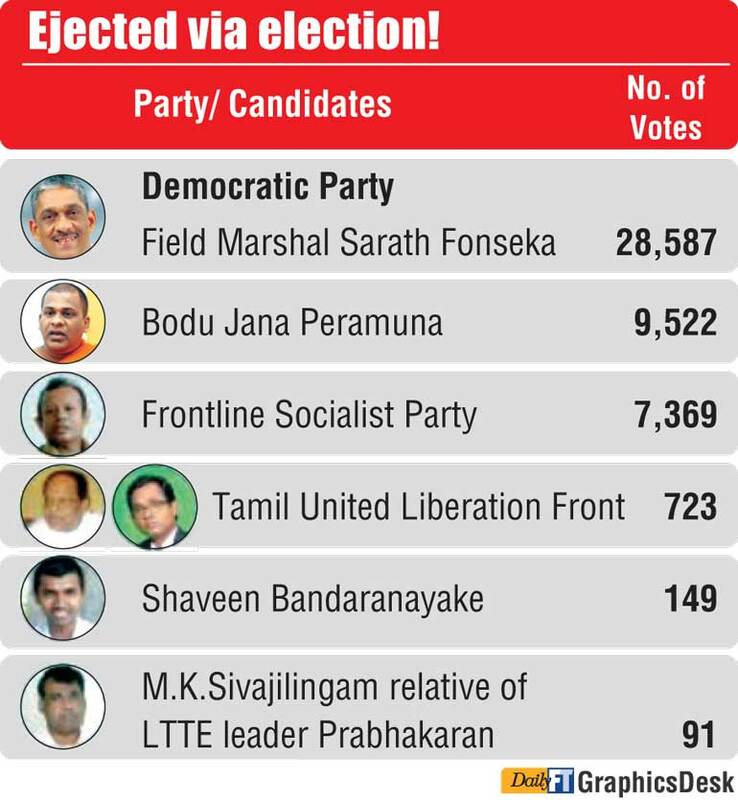 Sivajilingam, a relative of late LTTE Leader Velupillai Prabhakaran, contested from the Kurunegala District as an independent candidate and garnered just 91 votes. Shaveen Bandaranayake, son of former Chief Justice Shirani Bandaranayake, contested from the Colombo District under the Independent Group No. 9 and was able to earn just 149 votes. All former LTTE members who contested from the Jaffna District under Independent Group No. 4 failed to win seats in Parliament. They obtained a total of 1,979 votes from the district. Meanwhile, the Elections Department sources revealed that the deposits made by the independent candidates at the general election had been forfeited. The sum deposited by the 2,498 independent candidates amounted to Rs. 4,996,000.